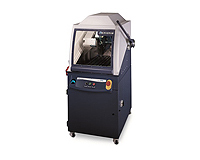 The AbrasiMet 250 Manual Abrasive Cutter features manual cutting action with best in class lighting, visibility and cut capacity. 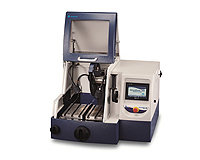 With its large workspace and versatile vising options, this cutter enables simple, quick and easy positioning of samples for cutting and sectioning. When combined with the PetroCut™ Vise Table, the AbrasiMatic 250 becomes a highly competent Petrographic or Geological cutting tool. 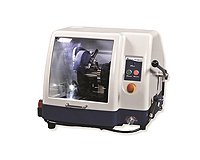 The AbrasiMatic 300 Abrasive Cutter is a bench top cutter featuring manual cutting action in 3 directions or automated cutting in 1 direction. The 4 sectioning methods available are: Z-axis(up-down) chop direction, X-axis serial section direction, Y-axis longitudinal direction, or automatic Y-axis sectioning. The Delta Manual Action Cutter, quickly cuts samples up to 5in [127mm]. An adjustable, manual lever arm enables operators to control the feed rate. Three button control is simple to operate. Highlights: large workspace, accessible blade chaning, coolant spray shield, hood safety lock, electronic brake.